Since you can't go back (according to the laws of physics and The Weepies), this week I'll recommend what I'm looking forward to in the coming weeks. They're all destined to be great. Maybe. I generally don't like suspense. I like to know where the next paycheck is coming from and if my pants are going to fit after eating cheesy bread. But author Ted Dekker is one of my rare "whatsgoingtohappen" exceptions. As the son of missionaries to headhunter tribes in Indonesia, his imagination is unique. 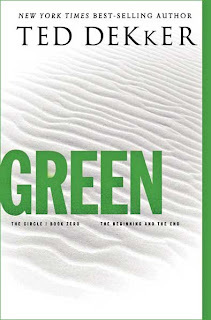 Green, available on September 1, is the prequel and the final book in the Books of History Chronicles. You can also purchase the other three books in the series without the wait. The first book I ever highlighted in The Rabbit Recommends was The Time Traveler's Wife. This is one of my top ten reads of all time. It makes my brain hurt and celebrate all under one book light. The film adaptation is sure to fall slightly south of my expectations, but Eric Bana and my fave mean girl, Rachel McAdams, give me hope. Releases August 14. Don't be ashamed. If you like a 19-year-old American Idol winner who is too tall for her own good, then admit it. That's what I'm telling myself. Her new album, Battlefield, is an absolute guilty pleasure which kept me moving on the treadmill - a respectable feat. I have provided her second single, SOS (with a fun trip down memory lane sampling from Shannon's Let The Music Play.) Releases July 21. So what are you looking forward to? If you tell me, then maybe I can look forward to it too. I need to read The Time Traveler's Wife. I love Dekker's books although I was getting a bit bogged down with the trilogy so i'm undecided about reading Green. We should go see it together!! S: We should. We will. It's been decided. I have wanted to read The Time Travelers Wife but I haven't had the chance to yet. I didn't know they made a movie. Saturday's post. I hope you like it. I'm torn about the time traveler's wife. I expressed my hatred for this book before, but I think that's because I read it waiting for something to happen. Unfortunately, nothing ever does. It's only about this love story, Not so much about time travel. Now that I see the trailer, and I know what to expect, I might be interested in seeing it...might. V: You will love the book. 99% guaranteed. SS: Give into the dark side. It's your destiny.